In-Orbit Testing (IOT) of Bangabandhu Satellite-1 is expected to begin today as the satellite reached its orbital slot at 119.1 degrees east on Tuesday, an official confirmed. “IOT of the satellite will begin on Wednesday and we are hopeful about receiving signals within two to three days at Gazipur’s Joydebpur and Rangamati’s Betbunia,” Bangabandhu Satellite-1 Project Director Md Mesbahuzzaman told the daily sun on Tuesday. He said the satellite is now controlled from three stations in the US, Italy and South Korea. “Thanks to Allah, we will start the second phase from Wednesday and it will continue for the next 20-25 days,” he said. A technical team has already arrived in Bangladesh from the USA after the successful launch of the satellite, according to him. Another official said the satellite reached its desired location (orbital slot) between 2:30pm and 2:48pm on Tuesday. “I just tell you that we are in risk zone until successful completion of IOT of the satellite as several examples we have non viable of satellites after successful launching,” he said. The government will require at least three months for commercial operation of the satellite. The satellite was successfully launched from the historic Launch Complex 39A at NASA’s Kennedy Space Center in Florida of United States 16:14 local time (02:14 BST) on May 11. Most modern rocket “Block 5” version of the Falcon 9 of SpaceX has lifted the BS-1 for the orbit located at 119.1 degrees East. According to the agreement, manufacturing firm Thales Alenia Space of France will handle the satellite along with local engineers for next three years. To this end, an 18-member team of local engineers has already been trained up. Bangladesh will operate satellite from 119.1 degrees East using a payload comprising 26 Ku-Band and 14 C-Band transponders to deliver focused telecommunications coverage to Bangladesh. One transponder is equivalent to 36 MHz. 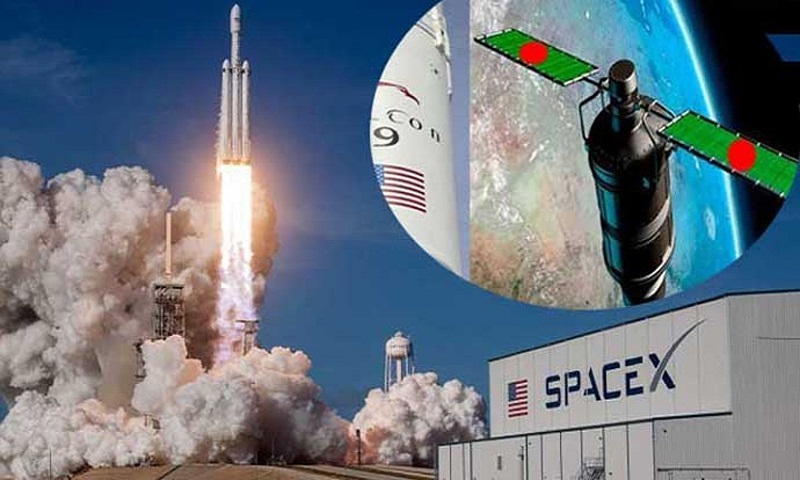 The government took the Bangabandhu Satellite-I project in May 2015 and assigned the Thales Alenia the task of manufacturing work by signing a $248million deal in November the same year. Thales Alenia completed the manufacturing works of the satellite few months ago and kept it in a warehouse in Cannes of France. On March 29, the satellite was shifted to Florida.